Iran Mounts , has been shaped out of orogenic motions of tertiary geological period; its existence factor of which, are the pressure of Arabian plate over Eurasia plate & the volcano, causing to mineral springs being formed. These changes, have continued as well throughout the other periods of geology; with erosion of current waters as the most important external factor of unevenness changes. These mounts, covering around 54% of country area, have converted Iran to a mountain land with an average altitude of 1200m from sea level (Iran Mounts, Cheshme publication, Qodrat Kasraeyan). Four original mountains of Iran are: North Mounts, Zagros Mountain, Central Mounts, & West Mounts. The North Mountain/ Alborz(950 km in length & 51500 km2 in area, equal to 3% of country’s), is a part of Alp & Himalaya folds. Starting from Ardabil province, this mountain eastwardly passes from Caspian see south & at the North of Khorasan joins Eastern mounts of Iran. Starting from Ararat Mounts of Turkey alongside with Alamdar mounts, Sahand, Sabalan, Talesh mounts, Qaflan Kouh of Azirbaijan, Alborz mounts on Tehran North & Southern parts of Gilan & Mazendran Province, Aladaq Mounts, Binalud, Hezar Masjed & Qare Daq on Khorasan, the Northern mounts join Hendu Kash Mounts in Afghanistan. As the tallest one of these Mounts, Damavand(5671 m) is Considered the highest spot of Iran. The Western Mountains, Iran hugest & longest ones, starting from West Azerbaijan Province, pass through the provinces of Kurdistan, Hamedan, Kermanshah, Elam, Lore Stan, Khuzestan, Chahar Mahal Bakhteyari, Kohgiluye & buyer Ahmad, Bushehr, Fars, Hormozgan & continue to the North of Hormoz Pass & join Iran central mountains & Macron Mountain ranges. Zagros Mountains (around 1400 km in length & 100-300 km in width) include 323000 km2 (20%) of Iran area. Encompassing the overall of West, South-West, & a part of Country South, Zagros Mountains starting from Ararat Mounts, extended between West- North & East- South & includes the Mounts of Sari Dash, Chehel Cheshme, Panje Ali, Alvand, Bakhteyari, Pish Kouh & Posht Kouh, Qali Kouh, Oshtoran Kouh, & Zard Kouh. Dena/ Dinar(4409 m in height) is the highest peak of Zagros Mountain. (1460 km in length, & around 80 km2 in width), encompasses the area of 143000 km2. Hazar Mount(4465m in height), is the highest one of this Mountain range. Discontinuous Eastern Mountains of Iran (with North- South direction), start from Khorasan North, & extend in South to Sistan & Baluchestan Provinces & Makran Mounts; the tallest one of which is Taftan Mount(3941 m in Height). As the only active volcano of the country, thanks to Sulfur gases released in its mouth, always a white smoke is seen over its peak. Mountains in Culture: Considered as the tie between the Sky & the Earth, Mounts are the origin of the first waters, resulting in fertility. Amongst most of the cultures, & in the ancient times there have been many holy mounts, considered as the place of eternals, & the residence of gods. According to the ancients beliefs, the holy mounts have been the center of the earth; from which the axis of overall universe passes. 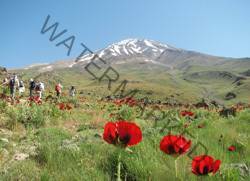 The beautiful Ode over Damavand & the famous lyrics collection of Shahreyar, Heydar Babaye Salam, addressing the Mount of Poet birth place, are the samples which manifest these mounts as the consideration center of contemporary poets.